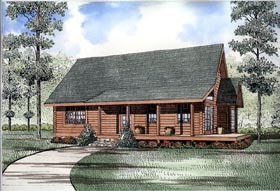 You?ll appreciate this log home plan with decks on three sides and grilling porch. The exterior may be typical of an original log home, but the interior is updated and ready for the arrival of family and friends. The living room ceiling is open above and in full view of the dining room and kitchen. This elaborate kitchen has a large walk-in pantry, a window above the sink and cabinets galore. A master suite is also located on the main level and has a private sun deck and spacious bathroom. Along with the oft area upstairs, which is open to below, there is a study/office, a bedroom and full bathroom with double vanities and a corner shower.